Copperfield Farm LLC is conveniently located 30 minutes between the Florida Horse Park and Rocking Horse Stables and minutes to Grand Oaks Resort. Limited training board options are available. 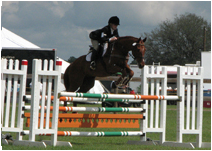 Excellent care equates to a happy horse in the show ring or out on cross country. Training and lessons are available on-site with Katie Walker. The education of horse and rider is tailored to each individual to better reach your riding goals. N-Lillie is offered for sale! Lillie is a talented young mare looking for her new rider. She has a foundation in eventing with solid flatwork that make her suitable for nearly any discipline. Contact Katie for more info. Want to "Talk Tack"? Ask Katie about County Saddles and why they are her saddle of choice.